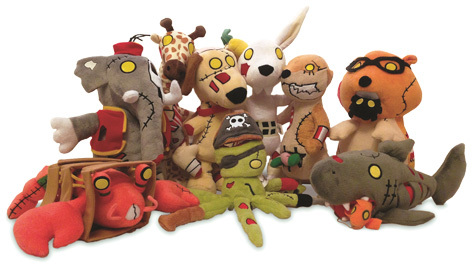 The "Animazombs" are a charismatic and collectable range of zombie animals that were brought to life by wacky scientist Professor Unbound in his efforts to preserve all life on Earth. By gathering every species on the planet and re-animating them in a half-zombie state they gain near immortality but with enough of their DNA retained for the species to be brought back should they ever become extinct. Series 1 includes three species from three sub-groups: Home, Deep Sea and Savannah. The nine characters are available in high-quality plush toy format ranging from 30-45cm, each with various features such as removable keyring charms or exposable parts, but with a cute, fun and charismatic approach. The characters are Thom the Elephant, Wilson the Giraffe, Samuel the Meerkat, Edgar the Octopus, Snyder the Shark, Wesley the Lobster, George the Hamster, Victor the Rabbit and Bruno the Dog. With Series 2 in development, a rapidly growing fan-base and programming being discussed, Professor Unbound is ready to share his creations with the world." Please tell us what you think of the Animazombs. Have just received Wesley the lobster and he's awesome. Cute little cage for him and it's nice to have a toy range slightly different to the norm!